To rigorously consider the impact of new media on the political and civic behavior of young people, the MacArthur Research Network on Youth and Participatory Politics (YPP) developed and fielded one of the first large-scale, nationally representative studies of new media and politics among young people. 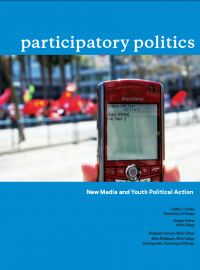 The study report, Participatory Politics: New Media and Youth Political Action, shows that contrary to the traditional notion of a technological digital divide, substantial numbers of young people across racial and ethic groups are engaging in “participatory politics” — acts such as starting a political group online, circulating a blog about a political issue, or forwarding political videos to friends. Like traditional political acts, these acts address issues of public concern. The difference is that participatory acts are interactive, peer-based, and do not defer to elites or formal institutions. They are also tied to digital or new media platforms that facilitate and amplify young people’s actions. The two principal researchers for the survey component of the YPP, Cathy J. Cohen of the University of Chicago and Joseph Kahne of Mills College, oversaw a research team that surveyed nearly 3,000 respondents between the ages of 15 and 25 years of age. Unlike any prior study of youth and new media, this study included large numbers of black, Latino, and Asian American respondents, which allows for unique and powerful statistical comparisons across race with a focus on young people. The YPPSP (Youth & Participatory Politics Survey Project) research team led by Cathy J. Cohen and Joseph Kahne is a project of the MacArthur Research Network on Youth & Partcipatory Politics (YPP). Cohen and Kahne are co-principal investigators and contributed equally to the writing of this report. Who is Online and What are They Doing? How Commonly do Most Youth use Digital Media to Engage in Participatory Politics, and is it an Important Dimension of Their Political Life? What Factors Make Engagement in Participatory Politics More Likely? Does New Media have the Potential to Facilitate an Equitable Distribution of Political Participation Among Young People from Different Racial and Ethnic Groups? Do Participatory Politics Influence the Amount and Diversity of News and Information that Youth Encounter? An Executive Summary of the YPP report is available here.